circling the wagons around their ancestral homelands of Saudi Arabia, Egypt and Israel. This is what is behind the announcement of an “Arab” army. Note that this is not a Muslim army since Turkey, Iran, Malaysia, Indonesia, Pakistan and other Muslim nations are not joining because they know the Hyksos countries are actually run by Satan worshippers. The Hyksos countries are being attacked by a joint Pentagon, Turkish and Iranian force and will soon be forced to surrender. In the propaganda news this attack is being explained as two separate events, one involving a US/Iranian attack against ISIS in Iraq and the other as a Saudi/Israeli attack on Yemen. 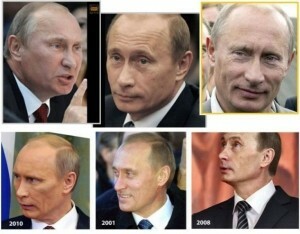 There has also been more information provided by the Russians about the mystery of Vladimir Putin. In the video at the link below (in Russian) you can see clearly that not only are there multiple Putins but there were also multiple Boris Yeltsins and multiple copies of the same Czar. This latest information from the Russians has allowed this writer to finally figure out a mystery. Over the years, multiple sources including the Chinese, the Yakuza and the Pentagon have talked about how Western leaders were being replaced with clones. I never wrote about it because it seemed too weird. Now however, checking the historical sources, I found out what is behind the clone business. The predecessors of the Hyksos were the Hittites in what is now Anatolia, Turkey. The Hittite leaders were being constantly killed in never ending power struggles. The Hyksos solved this problem by placing puppets on the throne and keeping the real leadership secret. The puppets could be replaced by look-alikes whenever they were killed. The Japanese Yakuza once told me they killed George Bush Sr. and he was replaced by a clone. I heard something similar from the British. I also heard that North Korea’s Kim Jong Il was replaced by a clone. There is no need to invoke the supernatural or unknown science to explain how this could be possible. It would simply be a matter of finding several identical people and grooming them to act like a leader during public events. The real leaders could then write the “acting presidents’” scripts from behind the scenes without fear of assassination. The question then of course becomes one of finding out who the real script writers or secret leaders are. Thanks to the internet and the ongoing global awakening, a lot of them have already been flushed out. We all know about the Rothschilds, the George Soros types, Freemasons, the gnostic Illuminati, the P2 lodge etc. What these various secret groups all have in common is that highly influential people gather in secret and form a consensus. They then force the public puppets like Prime Ministers etc. to carry out whatever decisions were made in secret. However, there also now exist benevolent secret groups fighting for the average man and not for the benefit of a Satan worshipping elite. They need to stay secret in order to avoid assassination by the Satanists. The battle has now reached the point where the Satanists are negotiating a surrender to the Red and Blue, the White Dragon Society and their allies. Furthermore according to the same source “Parliament was proroged (suspended from power) last Thusday in preparation for the election campaign. In effect the country is now being run by Cabinet Office and Sir Jeremy Heywood, Cabinet Secretary and Head of the Civil Service, until putatative ministerial oversight returns with a new Government sometime after May 7th. I need say no more.” In other words, the UK now has a meritocratic government. The US is also now under a de facto meritocratic government headed by the Pentagon and the agencies. In Japan, meanwhile, preparations are also underway for regime change. The Emperor’s US based handlers contacted the WDS after the Japan Independence Party called for the arrest of cabal stooge Shinzo Abe. The Bushes want to make a deal. UnConditional Love. We are Pregnant. Go with the Flow. Enjoy the Ride. Get a little closer to our daily lives. Copyright © 2015 Teal Eye, LLC., All rights reserved. We send updates and special interest emails to fellow loved ones interested in the ascension of humankind.